4-Word Review: Analyst on the run. 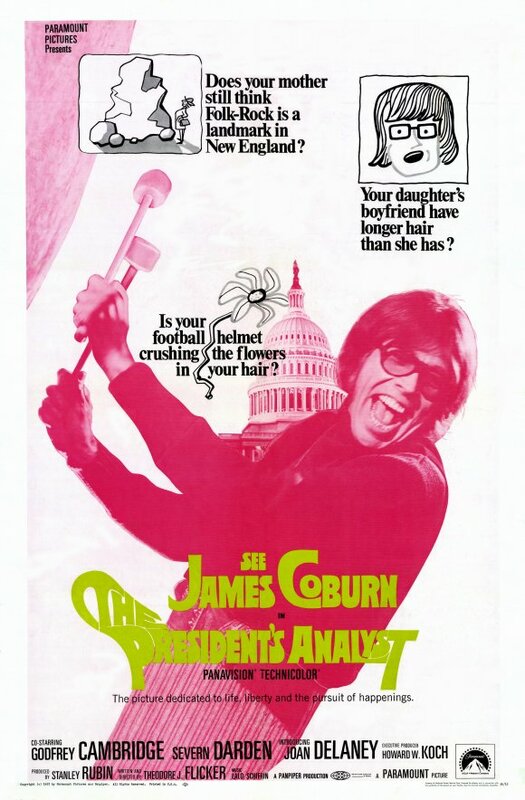 Dr. Sidney Schaefer (James Coburn) is a well-regarded therapist who gets offered the job as personal analyst to the President. At first Sidney is greatly honored, but eventually realizes that he may have taken on more than he bargained for. For one thing he must be on call to see the President at any hour of the day or night. Then he is forced to break-up with his girlfriend Nan (Joan Delaney) because it is found that he talks in his sleep and may be inadvertently giving away state secrets. When he tries to quit his job he finds himself being chased by government agents as well as spies from other countries intent on using or even killing him because of his perceived inside knowledge. The film’s biggest achievement is writer/director Theodore J. Flicker’s visual flair where he uses every chance he can to enhance a scene by adding some interesting cinematic touches. For instance the part where Sidney talks with his mentor (Will Geer) about taking the job while looking at some weird art exhibits helps add an offbeat touch to a conversation that otherwise is rather ordinary. I also liked the throwaway segment showing Sidney walking by New York’s landmarks including the Brooklyn Bridge and even standing at the torch of the Statue of Liberty. These scenes don’t necessarily progress the plot, but help add flavor and mood and something a lesser director might not even consider. Sometimes it’s the little things that get added to the picture that make it special and Flicker shows a good understanding of that and it’s unfortunate that he left Hollywood in the early 80’s to devout full attention to his award-winning sculpting as I think he had the potential for making a lot more interesting films. The comedy itself is quite funny and most importantly very original. Watching all the different foreign spies end up killing each other while also trying to nab Sidney as he hangs out undercover with a rock band is creative. The best part though is when he gets kidnapped while inside a phone booth and taken by truck to an underground headquarters where he is interrogated while still remaining locked in the booth. The film offers a chance at seeing Barry McGuire best known for his 60’s rock song ‘Eve of Destruction’ in a rare acting role as a guitarist in a rock band. Godfrey Cambridge is quite engaging as an American spy and I loved how he was secretly friends with his Russian counterpart Kydor played by Severn Darden. Jill Banner who gave a hypnotic performance in the cult classic Spider Baby is seen here as a groupie named Snow White. The film’s only real transgression is the fact that we never see the President or Sidney’s sessions with him. I believe this was because at the time there was still some respect for the position and the filmmaker’s didn’t want to completely devalue it by portraying some nut in the office, but it still seemed to miss out on some great comical potential as well as making the viewer feel that they are being a bit cheated. I also didn’t think that the President would have discussed important government affairs or foreign policy with his analyst like he supposedly does here. I would have thought that he would have been so burned out talking about that stuff that he would have wanted to discuss more personal issues that had nothing to do with politics. At times this film borders on getting a bit too wacky and out-of-control. This type of idea could have been taken in a wide array of different directions and there were moments where I wished it had been a little more reeled in and subtle, but it always manages to save itself by constantly coming up with unique and funny segments. Businessman Jonas Bracken (Robert Culp) living in Greece comes home one day to find his wife Ellen (Susannah York) and three children kidnapped by a terrorist group. 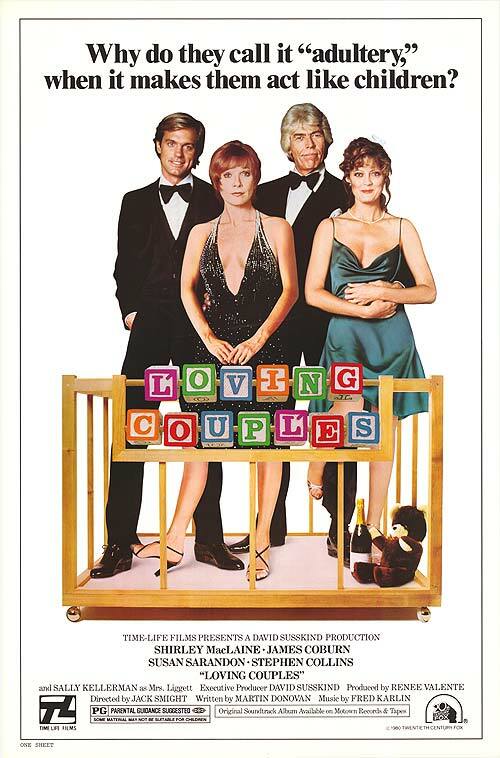 The police can seem to make no headway so Ellen’s ex-husband Jim (James Coburn) gets involved. After analyzing the background of one of the photos of the victims taken by the kidnappers he realizes that they are being held hostage inside a mountaintop monastery and the only way to get to it is by air, so he hires a crew of hang gliders to fly into the locale and rescue the family. The film is fast-paced it gets right into the story from the very beginning and never slows down. The kids are pretty cute especially the precious little girl, which helps the viewer emphasize with their predicament and urgency to get out. The Greek locations are exotic and help give the film an extra flair. The biggest problem is the script. The Coburn character has never hang glided before and yet somehow manages to be trained well enough in only a couple of days to fly into the steep mountaintop location without a hitch, which seemed farfetched. It also seemed highly implausible that this group of hang gliders who work at the local circus would be willing to take on such a dangerous mission or even know what to do once they landed and had to take on the gun toting bad guys. I would have expected a lot more missteps and mistakes from this novice bunch and yet they handle everything like they were a group of seasoned commandoes. Coburn’s performance is misguided as well. Normally I love his toothy grin and throaty chuckle, but here he does it while watching the hang gliders perform at the circus even though his ex-wife and son are being held hostage. I would have thought he should have been so nervous and tense that he wouldn’t have smiled at all and been instead in a perpetually serious manner. The scene of when they fly into the locale is done with a darkened lens to simulate nighttime, which beside being annoying makes it hard to see and lessens the dramatic effect as well as the excitement. On the whole it’s a very basic action flick and an empty-headed one at that. 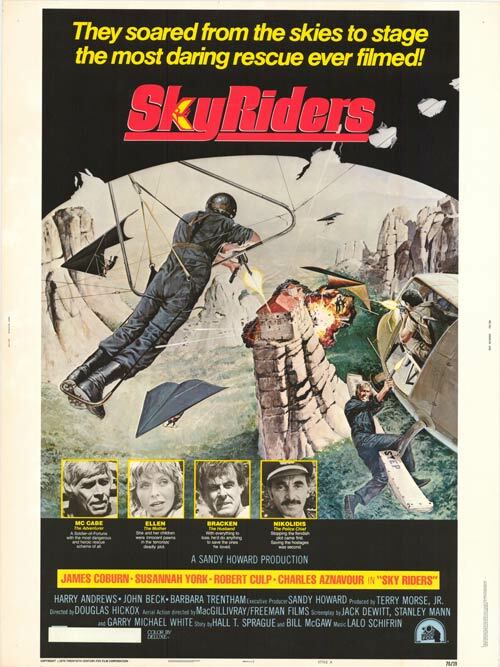 The terrorist group and their ‘cause’ are quite generic and the thin plot and cardboard characters barely camouflage the fact it’s just an excuse to show off some nifty hang gliding footage and nothing more. 4-Word Review: Robbery at an airport. Eli Kotch (James Coburn) manages to con his way out of jail by playing on the affections of his pretty jailhouse psychiatrist (Marian McCargo). His plans are to rob the bank at the Los Angeles International Airport while they are hosting the arrival of a Soviet Premier, which he figures will sufficiently keep the security personal distracted. The blueprint for the bank will cost him a hefty sum, so to help finance it he travels across the country seducing rich women and making off with their expensive possessions and money. Once the blueprint is purchased he assembles his men and executes the daring and elaborate scheme. The film, which was written and directed by Bernard Girard, is by all means slick although it goes a bit overboard. The first hour is hard to get into. The filmmakers seem intent to keep the viewer guessing about the Kotch’s motives and intricate plans as the rest of the characters. There is so much cutting back and forth between scenes in L.A. and Boston as well as all the lady victims that Kotch finds that it becomes confusing and off-putting. Everything comes off too easily for our protagonist. I suppose that is the intended charm, but a few hiccups here and there to their plans might have offered more tension and reality. He also beds too many women almost like he is some sort of modern day Don Juan. Having even just one of them slap him across the face when he makes his advances instead of just robotically disrobing and hopping between the sheets with him would’ve been funny. If this film were to be remade the women characters would have to be updated as here they are simply caricatures of a bygone era. Camilla Sparv’s character and the way Eli treats here was a particular problem with me. Sparv looks drop-dead gorgeous to the point of being breathtaking. Most men would feel blessed at having such a beautiful woman fall in-love with them, but Eli takes it all for granted. He callously lies to her and uses the genuine feelings she has for him to take advantage of her and use it for his own gain. It gets to the point where Eli starts to come off as a real cad and makes the viewer dislike him. There is a twist at the end involving the Sparv character, but it is not enough. I was really hoping that she would somehow manage to screw-up his plans whether intentional or not, but that doesn’t happen even though it should’ve. Coburn’s toothy grin and deep laugh manages to carry it and probably no other leading man would’ve been able to pull off this type of part as well. The supporting cast is equally good. Rose Marie is fun in a brief part as an older woman that Eli cons. Severn Darden is effective as the nerdy and smart, but very nervous member of Eli’s group. Nina Wayne is funny as one of Eli’s first female victims, a ditzy blonde filled with very quirky philosophies on just about everything. Yet it is Robert Webber, a very under-rated character actor, who steals the show as the high-strung head of the airport security. You can also spot a young Harrison Ford in a brief bit as a bellhop. The excellent on-location shooting gives the film an added flair. The shots of the Los Angeles International Airport are good especially the way it captures the iconic and modernistic Theme Building. Images of a wintry Boston during Eli’s jaunts to that city are quite scenic particularly all the tree branches covered with snow. The film’s final half-hour is captivating and even intense. The editing is excellent and the sheer brazenness of the crime is amusing. There are certain things though that seemed implausible and whether such a plan could be pulled off in real-life is doubtful. Still, if you’re a fan of heist films this should offer two hours of suitably fluffy entertainment, but just don’t think about it too hard.